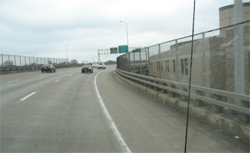 Interstate 380 (I-380) through Cedar Rapids and Hiawatha, Iowa, is a multilane divided urban freeway that was constructed in 1976 to the Cedar River and in 1981 from that point northerly. Traffic volumes vary from 47,000 to 83,500 vehicles per day, with about 8%­–15% trucks and buses. Based on concern for the high number of crash incidents, particularly serious crashes, and increased traffic volumes on this roadway, the City of Cedar Rapids and the Iowa Department of Transportation (Iowa DOT) District 6 Office requested that a road safety audit be conducted for this roadway section. Representatives from the Iowa DOT, Federal Highway Administration, Center for Transportation Research and Education, local law enforcement, local government, and area businesses met to review crash data and discuss potential safety improvements to this segment of I-380. This report outlines the findings and recommendations of the road safety audit team for addressing the safety concerns on this I-380 corridor and explains several selected mitigation strategies.